If you’re a regular reader then you know that I recently made the exciting announcement that I joined the bHome App (You can read all about the app here). And now, those talented ladies invited me to do a Holiday Tour with them, and well, of course I couldn’t say no! This is my third holiday tour this season (one more – stay tuned!) and though it sounds like a lot (especially for a not-so-big house!) I figure it’s better to break it up for all of you anyway. No one wants 50 photos in one post, and this way, I can talk details and really show you each area. But before we get to that, this tour from the bloggers of bHome (click here to sign up for the newsletter) also gives you a chance to enter to win an amazing giveaway! So be sure you read to the end of the post for all the details! 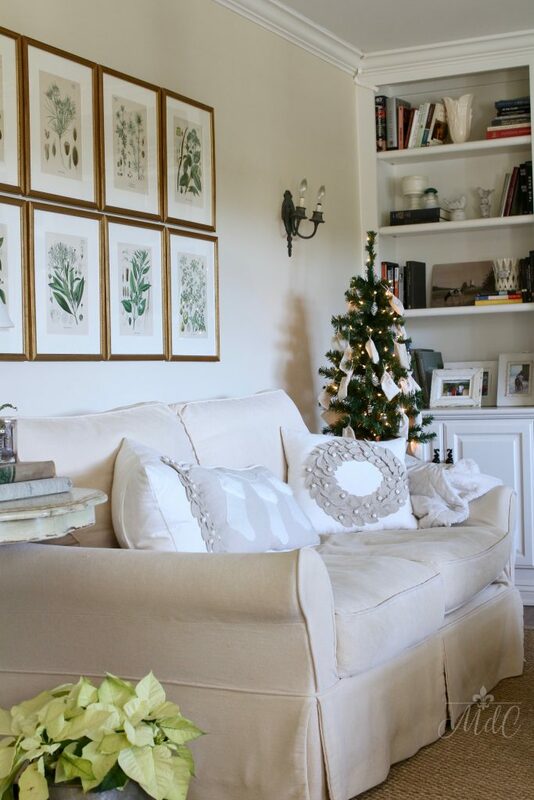 Today I’m taking you all into my family room for a French Inspired Christmas Tour. My entire downstairs is a pretty open floor plan, with the kitchen and family room being one big area. And you can see the living room from the family room, and vice versa, so it just makes sense for it to all have a cohesive look. 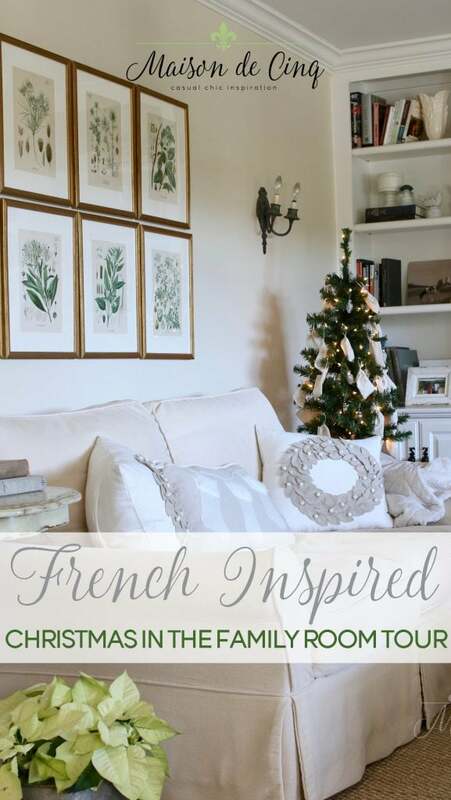 Recently I shared my French Country Holiday Tour featuring the living and dining rooms, which is why I’m calling this tour “French inspired.” The decor in those areas of my house set the tone for the rest of the downstairs. I’ve gone with the same neutral Christmas palette that’s in the rest of the home, featuring mostly greens, creams, gold, and white. So let’s get started! And welcome…. Like the previous tour, I used neutral colors of greens and creams with no red, and I’m loving the softer feel it imparts. This tree is a new one for me. I’ve always wanted a tree in this room but it’s been a little hard to find a tree that fit the scale of the room. I’ve had a larger live one here, and I loved it, but then it blocked so much of the builtins it didn’t really work. However, I’m loving the size of this King of Christmas King Fraser Slim tree and I think it’s scaled correctly for the room. And I absolutely love having a tree in the room I spend the most time in! 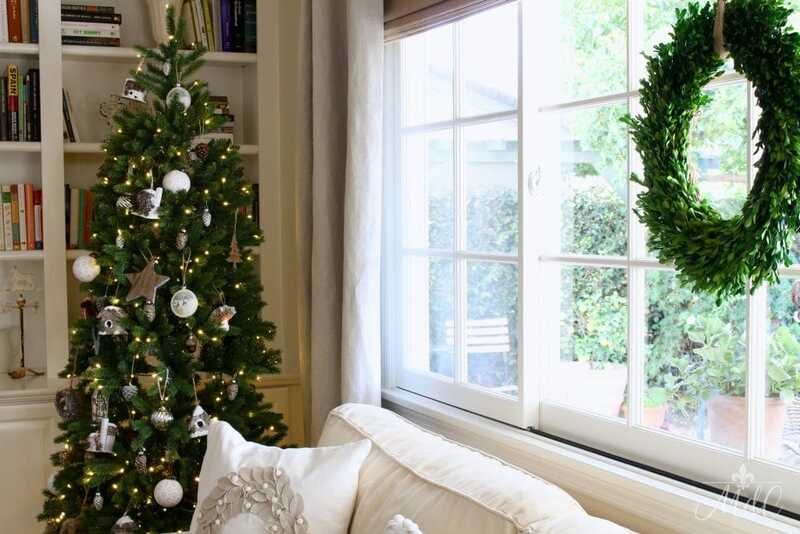 The wreath is the same as the ones in the kitchen, preserved boxwood from Target. 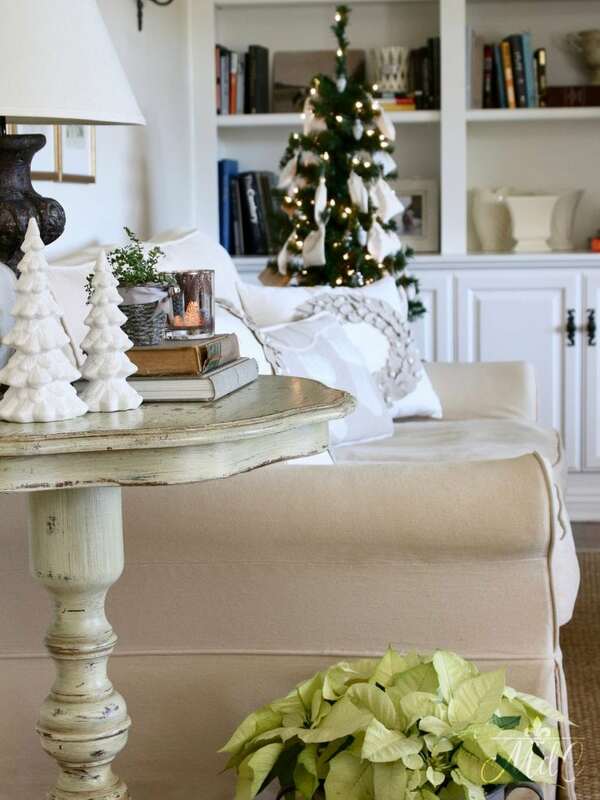 I love the look of boxwood, especially since I was decorating before any live greens were available! Because this room is more casual than the living room, I decorated the tree with more casual ornaments. They are predominantly earth tones, silver and white. I used several “woodland” themed ornaments like deer, bears, pinecones and little cabins. I love the natural vibe! 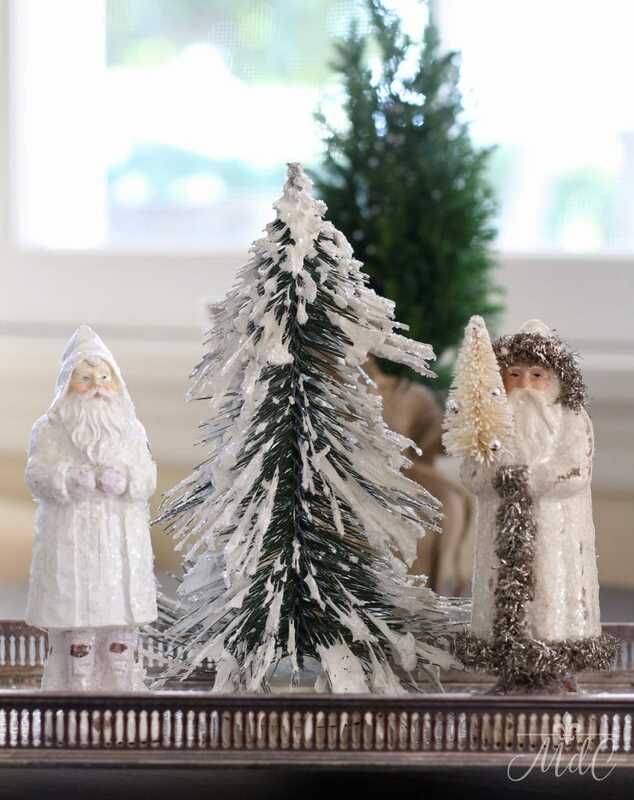 A couple of my Belsnickle Santas with a little tree nestled in a vintage silver tray. 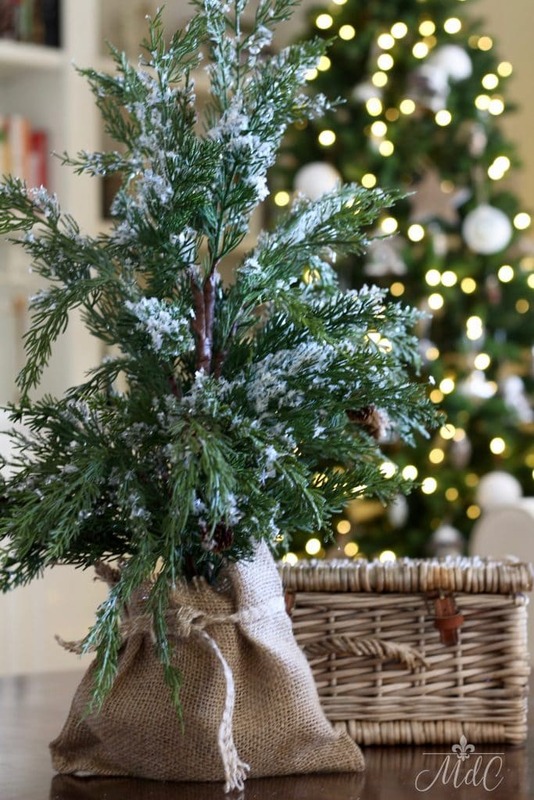 I’ve collected these for a few years now and I love sprinkling them around the house. 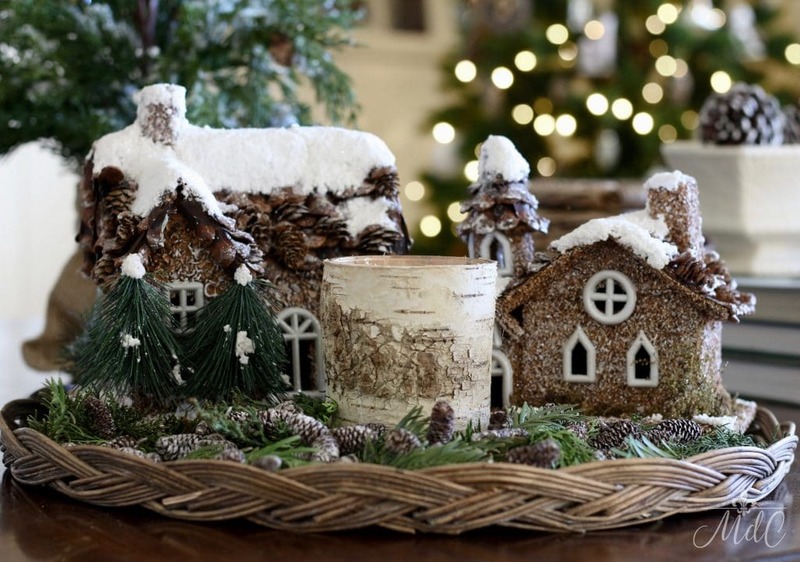 The little woodland houses were found at Home Goods last year. 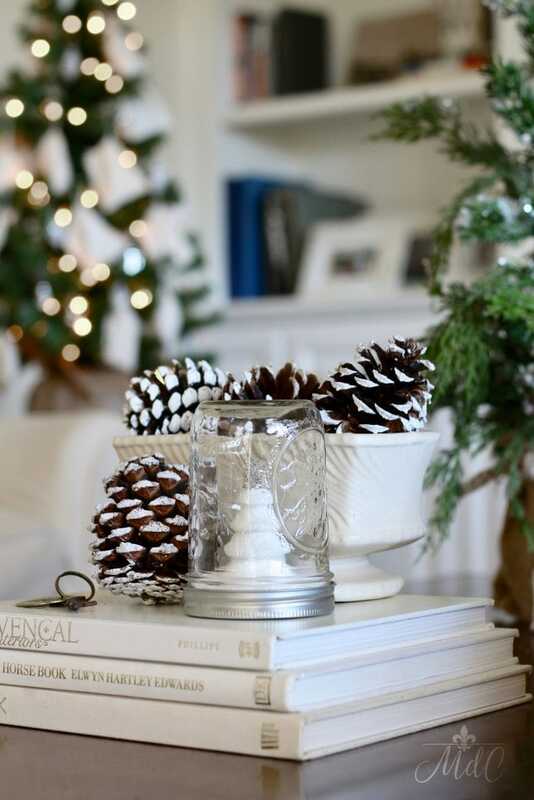 Combined with my birch wrapped candle and some greens and pinecones, it makes a natural themed vignette on the coffee table. On the other side of the room is my little tabletop tree, as well as a poinsettia in a vintage French bucket. 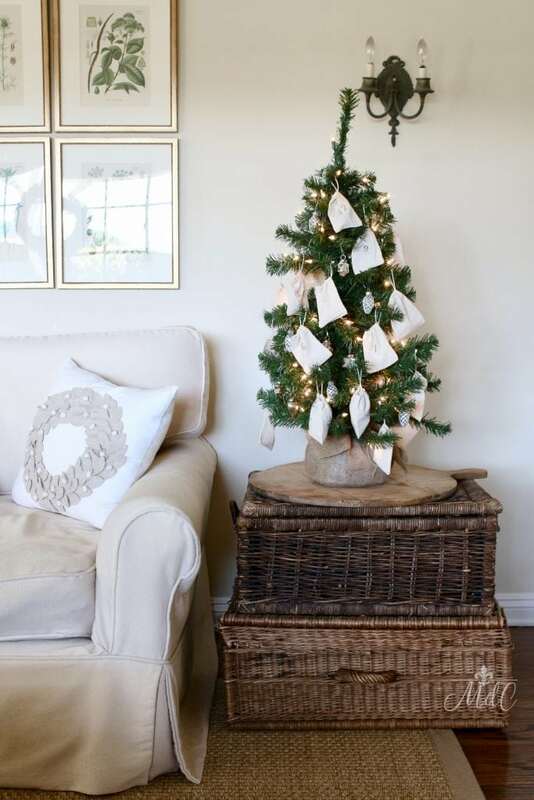 This little tree is now an advent tree! I’ve always had an advent calendar but the one we had been using was red and white and it just wasn’t working with my new neutral Christmas decor. 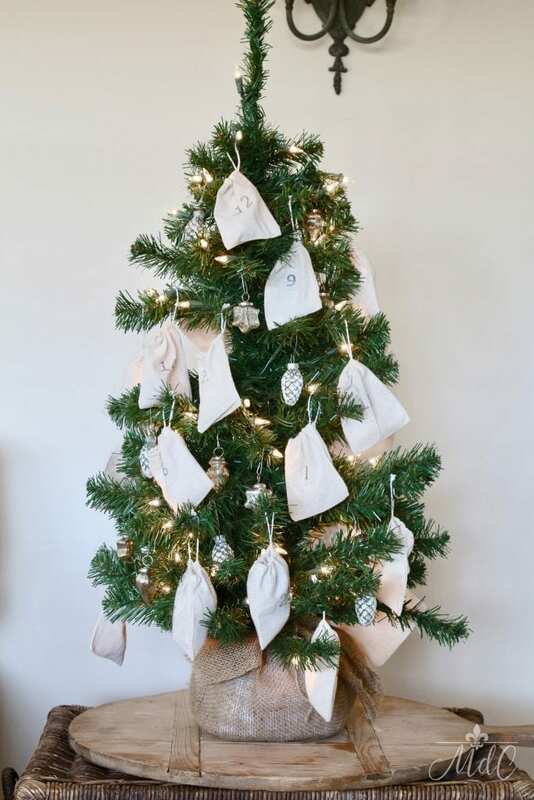 So, I decided to make my own using these little favor bags and hanging them on the tree I already had. A crafter I am not, but I’m pretty happy with how it turned out! I stamped the numbers on the little bags (I found them at Michael’s) and had fun filling them with little chocolates and treats. I also put some ornaments in as well so the kids can hang more ornaments on the tree as we take the bags off! The throw pillows are from both Home Goods and Wayfair. Painted pinecones add more of that nature-inspired feeling. 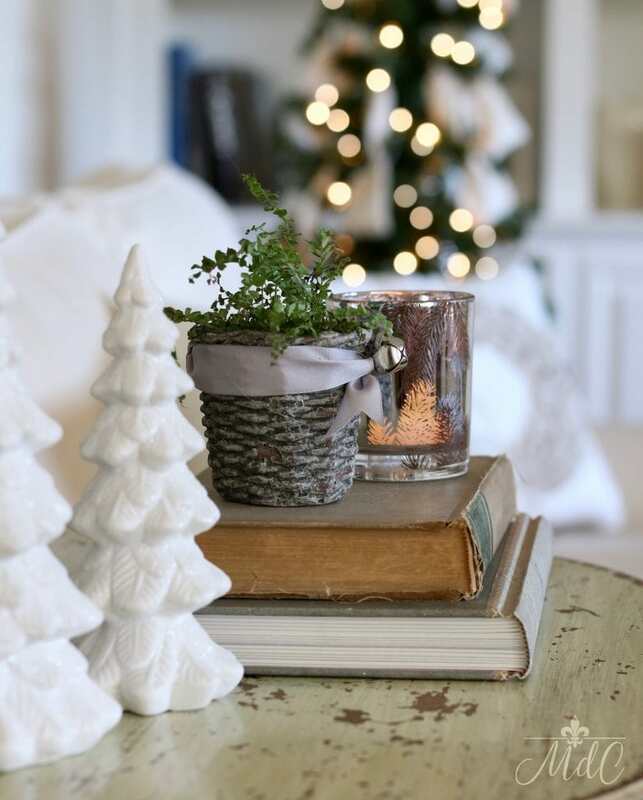 This mercury glass jar holds my all-time favorite holiday scent, Thymes Frasier Fir! I absolutely love this smell (you can read about all my favorite holiday scents here) and buy it in bulk in the fall because it sells out so fast! And my paperwhites. I just did a tablescape featuring them earlier this week, and I wish you could see them now. They are at least 3 or 4 inches higher than they are here! I’ve been wanting to grow them forever but had never tried it until this year, and I’m so glad I finally did! They should be fully blooming by Christmas. 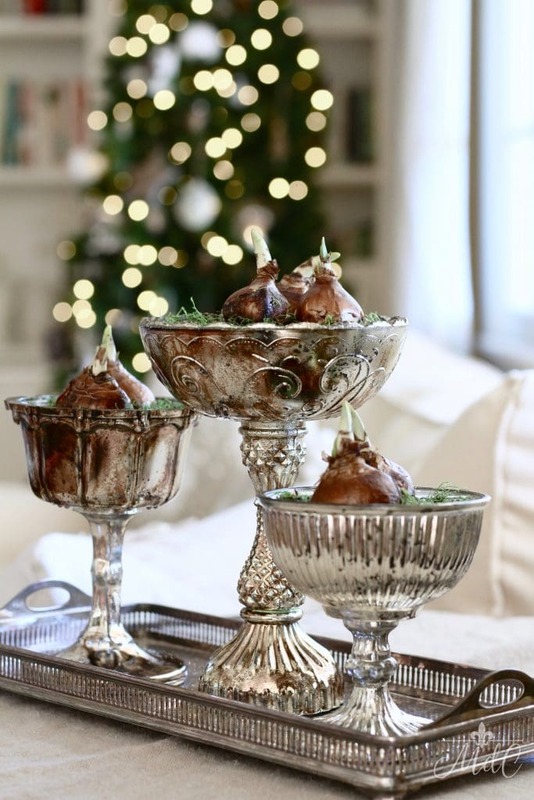 I found these adorable mercury glass pedestal dishes at a local boutique, but I sourced some below if you want to get a similar look. Thank you again for stopping by my French Inspired Christmas Tour! I know there are so many tours this time of year, and I so appreciate you spending your time here. And be sure to visit more of the tours below for even more holiday inspiration! Our dear friend Lidy of French Garden House is giving away a $250 gift certificate to her gorgeous shop!! 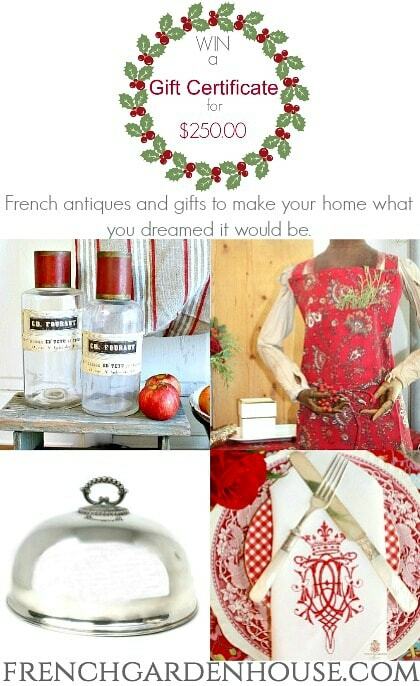 Visit FrenchGardenHouse.com and tell us what antique has captured your heart, then come back and let me know in a comment here. and FaceBook too. Just let us know you did. She has so many beautiful things it is hard to narrow it down to one but I really like the Antique French Tole Peinte Green Scenic Toleware Tray. I also follow her on Instagram as @maryjgardner and on fb as Mj Mary Gardner. And thank you for sharing your beautiful French inspired Christmas. Everything looks just stunning. Thank you so much Mary- I appreciate your sweet comment! Hi Sheila..I do not think my original comment went through so I will try it again:)!!! Your room is so very beautifully adorned for Christmas. 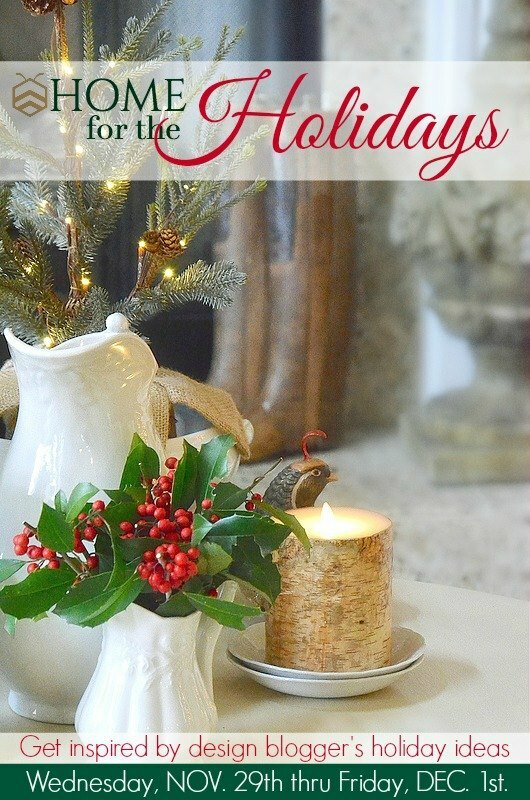 It is so elegant yet inviting and warm…just the perfect touch to make your family and friends feel right at home at Christmastime! 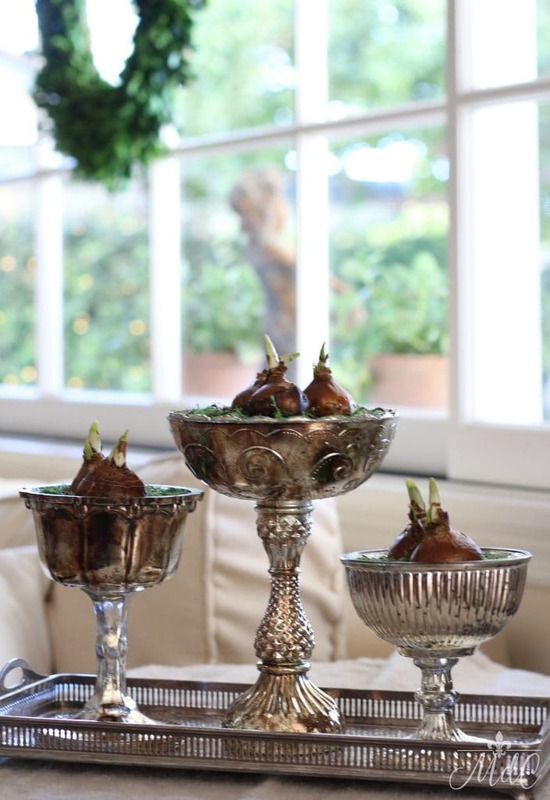 Love every beautiful detail right down to the trio of silver compotes for the paperwhites. A most wonderful French inspired room indeed! Love your home Sheila! Oh my Sheila!! 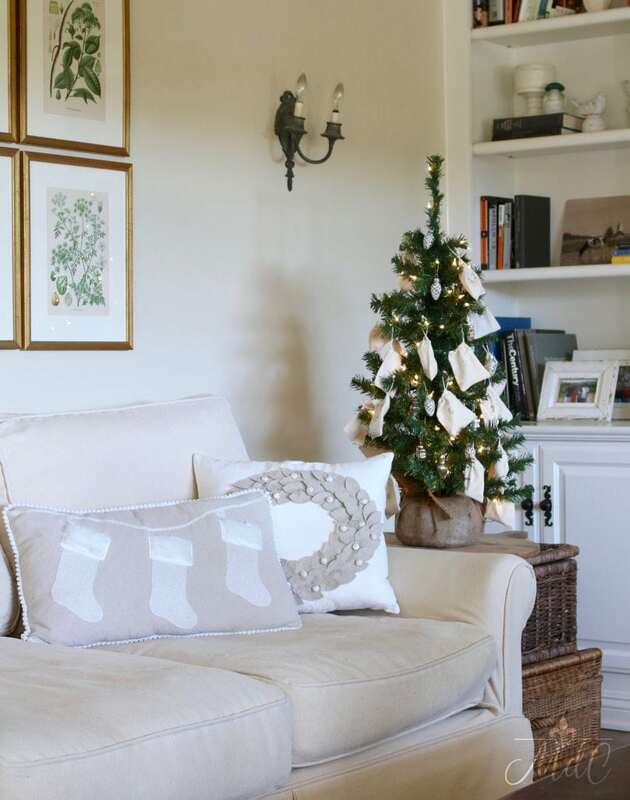 I love this room that you have so beautifully decorated for Christmas…yes, indeed so French inspired that you do so elegantly yet remains warm and cozy for your family and friends to enjoy. I surely would love to be able to sit in that room surrounded by the prettiest details of the Christmas and Winter season. I love how you placed your paperwhites in the compotes…just so elegant! Have a very Merry Weekend Sheila!! Hi Shirley and thank you so much for such kind words! I am so happy to be with you talented ladies on the tour, and want to thank you for all your hard work organizing – and always helping too! Hi Sheila I loved your home tour! I love how everything feels. Lady sure has so many wonderful treasures, I spent so much time looking at them and it was so hard to choose. I love all the canning jars, the greenish water pitcher, but my favorite was the blue cemetery vase, the porcelain onion board, and the blue and white Sell saltbox!!! Following her now on I G! I think you’re her new favorite customer Noni! Isn’t her store great? I’m glad you found so many things you liked! Thanks so much for your sweet compliment and for stopping by! What a great and unique store!!! I love the Antique Botanical Hand Colored prints, the set of 3 Preserved French Country Boxwood Hearts, and the Vintage Art Deco Green Open Salt & Pepper Stand. I’m sure my husband will have some favorites of his own too. 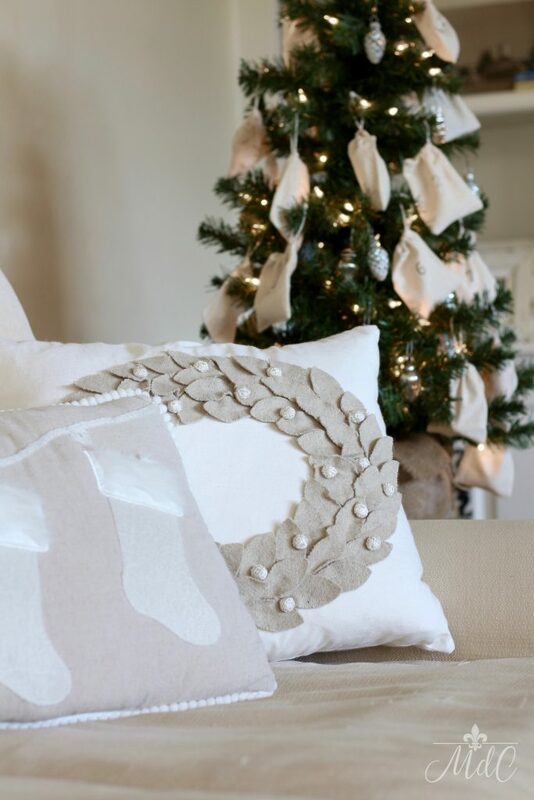 I love your elegant (but not stuffy) design for holiday. PS – I just followed @FrenchGardenHouse on instagram. And thanks for entering! so glad you stopped by today -and good luck! The room looks beautiful, Sheila! Elegant, but welcoming. Perfectly your style!! Thanks for coming over my friend! So pretty Sheila! I especially love your stacked baskets and paperwhites in silver. Hope you have a wonderful Christmas season! Thank you so much Julie! Wishing you a Merry Christmas too! 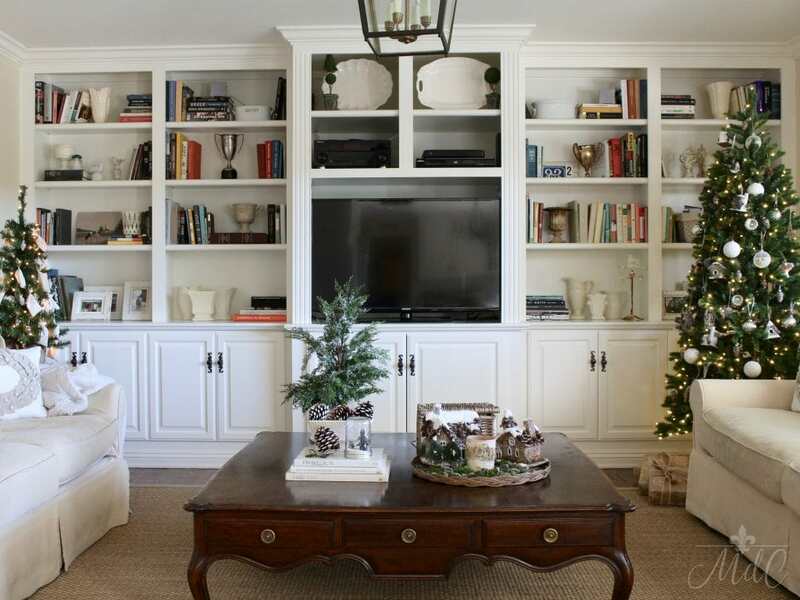 Your family room is stunning, Sheila! I really love the advent tree on the round board. I had such a great time looking at French Garden House website – so many gorgeous pieces! I love the cast iron french door knocker. Thanks so much Julie! She does have so many gorgeous pieces doesn’t she? Love her website! Enverything looks gorgeous Sheila! I love how to kept to beautiful shades of green and creams! I love the luxury one of a kind Paris roses wreath at French Garden House! What a wonderful source of beautiful decor!!! Isn’t her store wonderful? So glad you popped over to enter! And thanks for your sweet comment, too! Everything is so elegant and stunning, Sheila! I love the pops up fresh green against your neutral decor. You captured some really beautiful shots of all the pieces you used. 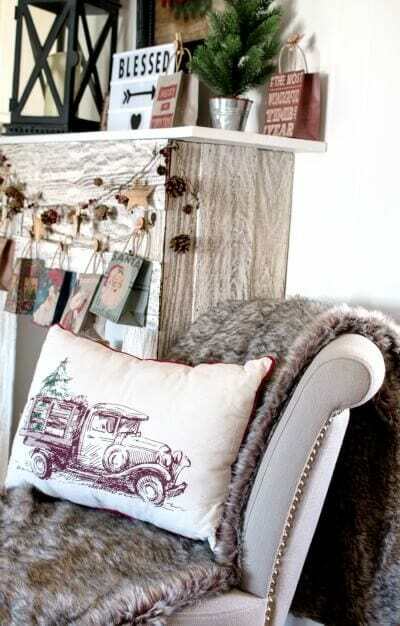 Love those prints above your sofa and love your Christmas pillows. Beautifully done, my dear friend! And oh what a great giveaway! I would be so thrilled to win! Thank you so much Summer! Good luck!! So happy to be joining you talented ladies on this tour – and Happy Holidays to you too!